I know it’s been a while since I updated, but I needed a bit of time to process the plan as it was set forth at Colman’s last clinic visit to TCH. Colman and I left early in the morning instead of going to Houston the night before. It makes for a pretty long day. Our first stop, as always, is the pathology lab so Colman can have his blood drawn. 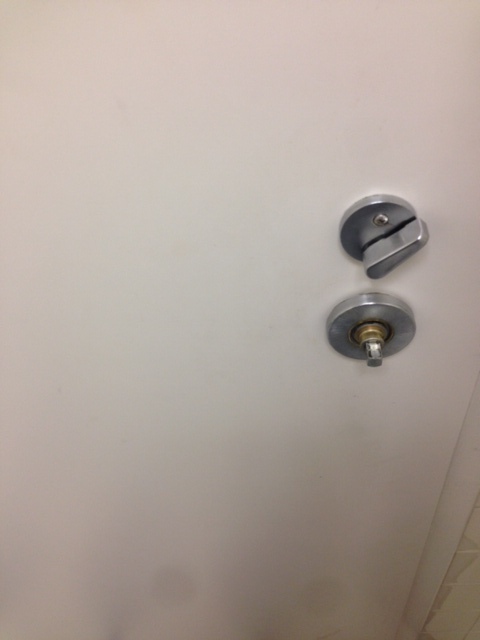 While we sat down to wait for his name to be called, I decided to take a quick stop into the bathroom, but I didn’t notice this until after the door slammed shut, of course. He was pretty absorbed in his video game. I’m surprised he even heard me. I’m hoping when they called his name, he would have said something, like, “My mom went into the restroom and never came out,” but who knows? 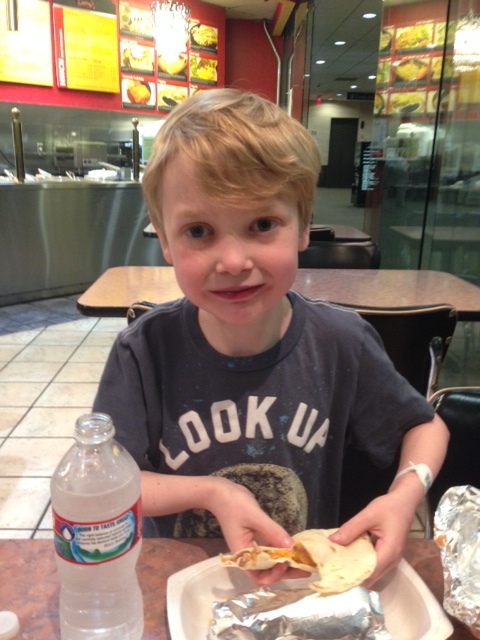 After they drew blood–No tears this time–we went directly to the 20th floor for Colman’s echo appointment. At this point, I had several texts and missed voicemails from Kevin appear on my phone. (My phone doesn’t work so well in the basement!) He’d gone out of town for court and lost his wallet. I’m never really sure what he thinks I can do in situations like that, except say, “I’m sorry.” I mean, I wish I could channel Hermione Granger, wave a magic wand and make said wallet reappear back in his pocket or briefcase, but I cannot. I can’t even do a respectable English accent. Yes. That’s what happens when your wallet goes missing. “There’s got to be some money lying around the house somewhere,” I said. But then I had to go because they were calling Colman’s name for the echo. On one hand, instead of Colman being annoyed during the echo like he usually is, he was worried about the fact that daddy had lost his wallet and pretty much relayed the lost wallet story to everybody we came in contact with at TCH, including doctors, nurses, and this girl in the background who did his echo. During the echo, I noticed that the thrombus had reappeared in Colman’s left ventricle, which is a bummer. Thirteen months of Lovenox injections twice a day for nothing. When we finally got in to see the cardiologist for our clinic appointment, she thought a good course of treatment for the thrombus would be to just ignore it, and I’m down with that. The injections are no fun. Colman still has not grown or gained any weight. He’s holding steady at 42 pounds and his height was 3’11” (and a half). 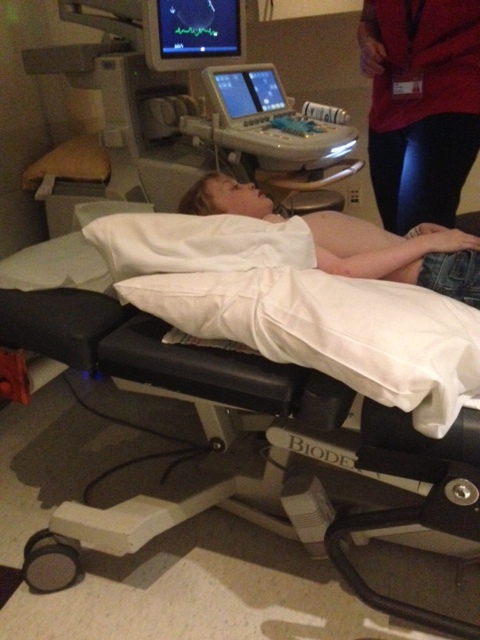 The plan moving forward is to take Colman back to the cath lab. In the cath lab, they can measure his heart and lung pressures again. They also want to try closing the fenestration in his Fontan conduit. They’re not sure his heart will tolerate the closure, but they want to try it to see if they can get his oxygen saturation level up. They think that might make him feel better, therefore, he’ll eat more and grow. Dr. Denfield also mentioned something called a metabolic cart. So far, they’ve only done this on children who are inpatient, but she felt there wasn’t any reason it couldn’t be done on an outpatient basis. The results of this test would let us know exactly how many calories Colman is burning throughout the day. This would help us get a better handle on Colman’s caloric intake and output and how much he needs to take in to sustain and grow. Right now, we’re estimating his calories like he’s a regular kid, then adding an extra 200 to 400 calories every day to compensate for his heart. But we could be in a situation where his body is burning more than he could possibly eat, which would point back to his heart and a failing Fontan. She assured me that they didn’t see any red flags, and they felt confident they would be able to list Colman for a heart, even with the antibody and collateral issues, when the time came. “Do you really think this is going to work?” I asked. We sat there for a minute. “Do you have any more questions I can’t answer?” she asked, and we both laughed. One of the nurses from the cath lab came in and asked if we’d be able to meet with the interventional cardiologist, Dr. Liou, around 3:00 p.m. because she needed to talk to us about the upcoming cath. Dr. Liou was just finishing up a case, which gave us about 45 minutes to grab a bite to eat. Colman insisted we try to find this little mexican restaurant where we ate one time when Mimi was in Houston with us, and we ended up walking about five blocks in order to find the restaurant that was just one building over. He ate every bit of his bean and cheese taco and a whole bowl of nachos, which made it all worth it. Then they talked about it and she said she’d need to sleep on it. What she told me was that closing Colman’s fenestration could make him very sick again, and she wouldn’t want to be the one to make him sick. However, she concluded that closing the fenestration does not burn a bridge. We can always take him back into the cath lab and make another fenestration. Of course, that’s another surgery, another time inside his heart, another time under anesthesia. All of it has risks. In speaking frankly with her, she doesn’t know that this is the answer, but there is a tiny bit of hope that this might actually help Colman and that’s what they’re all focusing on. She’s going to measure all of his heart and lung pressures again and see where we are. Then she’s going to occlude the fenestration with a balloon and wait, ten, fifteen, twenty minutes, all the while measuring Colman’s pressures. If she thinks his heart can tolerate the closure, she’ll go ahead and patch the fenestration. But she warned me that he could get very sick again. This closure could totally change the hemodynamics of Colman’s heart. His plastic bronchitis could come back. He could get fluid build-up, ascites or protein-losing enteropathy. If he does get sick, she’ll go back in and either take the patch out or make another fenestration. So we’re moving forward. If Colman’s pressures are high or they’re not able to close the fenestration, he’ll probably be listed for a heart shortly thereafter. If he’s able to tolerate the closure, then we wait and see if having higher oxygen saturations help him to feel better and grow. Colman’s heart cath is scheduled for May 22nd, and he’s having the metabolic cart test right before he goes into the cath lab. He will most likely stay in the hospital one night after the cath, especially if they’re able to do the closure. Colman’s already let me know he’s not happy about the overnight stay in the hospital. Not long after we got home from Houston, I heard Kevin tell Liam to grab his sunglasses because he was going to need them for his ball game. Liam couldn’t find them anywhere. I had to stifle a giggle as I joined in the hunt for the sunglasses. That’s a little bit of the pot calling the kettle black. The janitor at Kevin’s work found his wallet under his chair a couple of days later–after he’d replaced all of his credit cards and gone to the DMV to get a new license. LOL! And Kevin managed to get by with $14 in change he found in the console of his car. In telling his tale of woe at the baseball fields, one of the moms offered to give him $20, but he said he could get by with the change from his console. I will definitely give Kevin Gary’s number. Thank you! You’re so strong Heather, and so is the mighty Colman! Keeping you guys in my prayers! Hi Heather. I just joined the “followers” of your blog. I’ve read a few of your updates in the last year or so, and I have to say I am simply in awe of you, your strength, the strength of your love, and Colman’s. I am amazed by your ability to deal with this painful topic (I can only imagine) while mixing it with laughter. I don’t have the right words to say, nor the answers, but I believe you and your family will find them. Perhaps not having the words or the answers has been what has prevented me from joining the followers before. I will watch and wait, expecting good news in the future, if nothing else but by the force of your will. I do know that miracles exist, and I believe there’s one for you and your family. Give my regards to Kevin, and know that there’s one more person “out there” who cares.